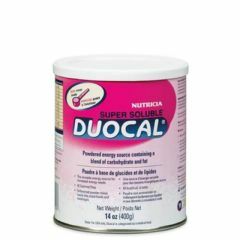 Duocal Powder is a high-calorie, protein-free, lactose-free, gluten-free powdered food that can be used orally or in tube feedings. Duocal Powder provides fat and carbohydrate for increased caloric intake for children over 1 year old. Duocal was developed specifically for protein and/or electrolyte restricted diets. Super Soluble Duocal Powder is completely soluble in water, liquids and moist foods without altering taste. Unflavored. 1968 calories in each can. Hydrolyzed Corn Starch, Blend of Refined Vegetable Oils (Corn, Coconut), Medium Chain Trigylcerides (Fractionated Coconut Oil), Mono and Diglycerides, Diacetyl Tartaric Acid Esters of Monoglycerides. Intake to be determined by a medical professional and is dependent on the age, body weight and medical condition of the patient. Measure the prescribed amount of Super Soluble Duocal Powder. Add powder to the required volume of liquid and/or soft food and stir continuously until the powder has dissolved. Unused foods mixed with Super Soluble Duocal Powder should be refrigerated and used within 24 hours. Please Note: Household measurements are approximations only. For most accurate results, use a gram scale. Precaution: Use only under strict medical supervision. Not suitable as a sole source of nutrition. Not for parenteral use. Not suitable for children under one year of age. Store unopened can of Duocal at room temperature. Once opened, reseal can and store in a cool, dry place ( not in a refrigerator ) and use within one month. the product made my daughter sick and very ill. Mixes very well! No bad taste! Goes Down Easy. Simple To Take. Medical Professional. First Time User. parent of child. Our son has a disorder where it is hard to maintain calories. This product is very helpful! Produces Results. Simple To Take. Acts Quickly. My daughter has poor weight gain and this was the easiest approach to getting more calories into her diet without requiring her to eat more. We just add it to her milk and she doesn't even know it's there! Her doctor was satisfied with her improved weight gain so that makes us happy too! The best thing about buying it here is that it's a great price. Since it's not covered by my insurance this was a no brainer. Good Value. No Side Effects. Boosts Energy. i use this product to help my son gain weight it is added to his meals and it works! We use it 3 times daily with our 3 year-old's boost essentials 1.5 to add calories without altering the taste or increasing the volume. He doesn't know it's there, but we can tell by his weight gain! MY SON IS 9 YEAR OLD. SHALL I USE DUO-CAL? WHAT DOSAGE I SHOULD GIVE HIM?